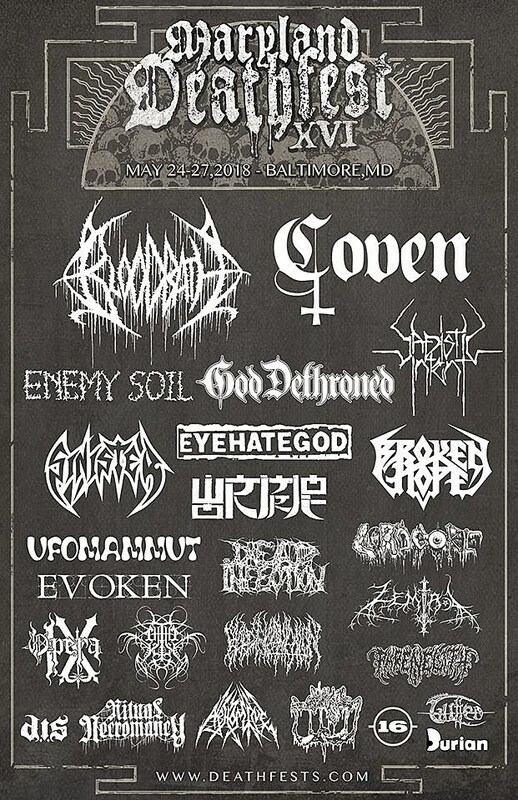 Maryland Deathfest 2017 wrapped up about a month ago, and the 2018 initial lineup is already here. It includes occult rock pioneers Coven, who just played their first US show in 27 years at Northwest Terror Fest. It also includes Eyehategod, Ufomammut, Wormrot, -(16)-, Bloodbath, Enemy Soil, God Dethroned, Blood Incantation, Evoken, and still more. Full initial lineup below. As usual, MDF happens Memorial Day Weekend, May 24-28, at Rams Head Live and Baltimore Soundstage. Early Bird tickets are on sale now. There is also an MDF doc on the way.